It all added up to a fifth-place finish for Boone Central/Newman Grove in the 2015 Mid State Conference Tournament at Norfolk this past week. The Cardinals, seeded 5th in the tourney, appeared headed to a hard-fought first-round victory Tuesday before #4 Wayne banked in a half-court prayer to pull out a 61-60 overtime victory. BC/NG players did not hang their heads, avenging a previous loss to Class C2 #3 Battle Creek Friday, then blasting O’Neill in Saturday’s consolation contest. Boone Central/Newman Grove (10-8) turned a slow start into a spirited comeback in Tuesday’s first round, using a tenacious finish to force overtime and holding a two-point edge with just 2.8 seconds remaining in the extra period. The Cardinals ended up be-deviled, however, as the Blue Devils’ final desperation heave eventually found the net. There are ugly basketball games. But there are no ugly victories. Boone Central/Newman Grove bounced back with a gritty effort Friday, rattling Battle Creek defensively and rattling just enough peach baskets offensively, to nip the Braves 42-39 in consolation-bracket play. The Cardinals certainly didn’t win the contest on the offensive end, sinking just 13-of-37 two-point field goal attempts (35%) and only 2-of-15 three-point tries. BC/NG got to the free throw line 23 times to Battle Creek’s five attempts, but was able to make just 10 (43%). At the other end, however, the Cards clamped down, holding Battle Creek to 25% shooting, while not fouling, and outrebounding the Braves 50-41 (yes, there were a lot of rebounds in this game). After two tooth-and-nail cliffhangers, BC/NG allowed its fans to finally sit back and relax a bit Saturday, dominating O’Neill in a 58-38 victory for fifth place. Scott Ketteler and Keaton Henry hit three-pointers as the Cardinals doubled the Eagles in quarter one, 16-8, and the lead grew to 30-17 by halftime, boosted by Zac Glidden’s eight-point second period outburst. “We got a good start. We pounded the ball inside, as we expected we could. This really helped get players open on the perimeter. 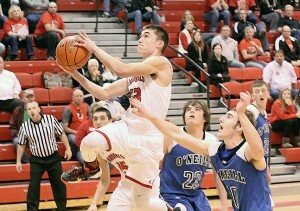 In the second, we were getting the ball out in transition, making O’Neill defend full court.